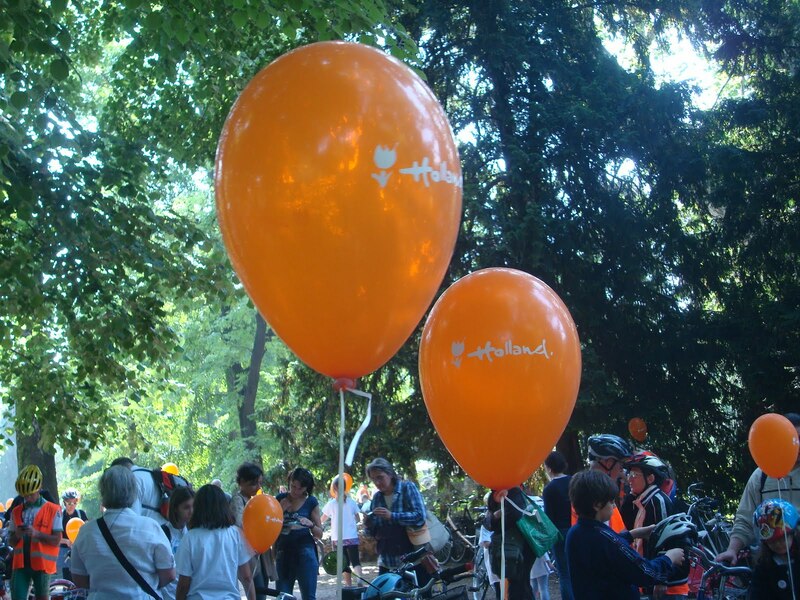 Yesterday we participated in an event called Bimbimbici (children on bikes) organized by an association that is trying to make Italian cities more bike friendly. It was a beautiful day and since we recently bought our daughter a new bike it seemed like the perfect occasion to take her out for a ride. A friend kindly lent us a bike with child seat (mine broke and I haven't replaced it yet) and so our youngest also got his first chance to ride on the back of my bike. 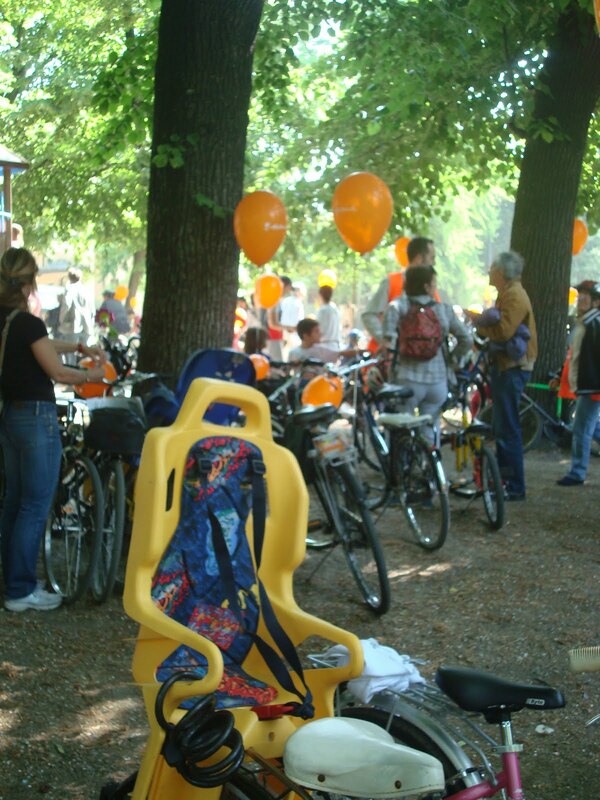 Needless to say he loved it and had a smile stamped on his face for most of the ride (expect when the many bikes had to turn into a smaller street making us stand in the scorching sun for a few minutes; he was quick to let everyone know how unhappy he was). Our daughter could not believe that she could finally get off the sidewalk and ride in the middle of the street, with actual policemen standing all over stopping cars to let us pass. My husband was especially happy pedalling around town looking at all the black and red flags hanging out of windows, after his soccer team won the Serie A title on Saturday night. So to celebrate I made this little treat for him. The man loves pistachios and Reeses' almost as much as his team and always fights the temptation of bringing back a few suitcases of the latter whenever we travel to the States. 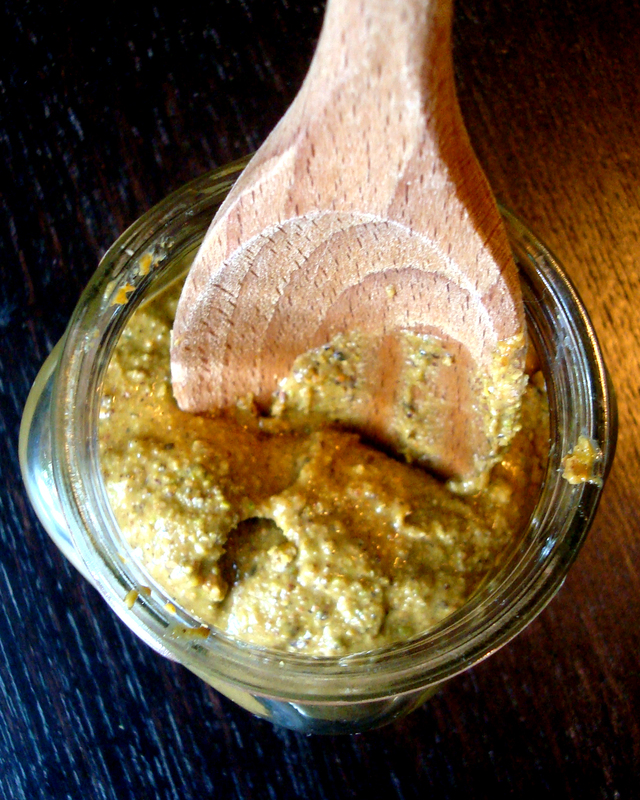 I read this wonderful recipe a while back on Heavenly Housewife's blog and fell in love instantly. I went out and bought a few bags of pistachios and have been waiting for the time and occasion to make these. My advice is not to make these because they are addictive. 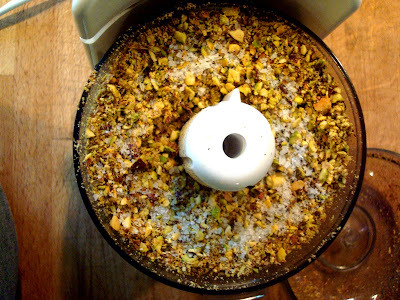 But if you really want to (don't say I didn't warn you), the first step in this recipe is making a lovely pistachio butter by toasting the nuts until your kitchen smells delicious and then grinding them to a luscious green spread. 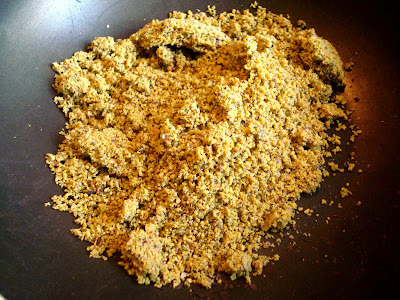 You can make a lot of it like I did and store it in your fridge in a sealed jar to use in a pasta sauce or to smother onto crostini. 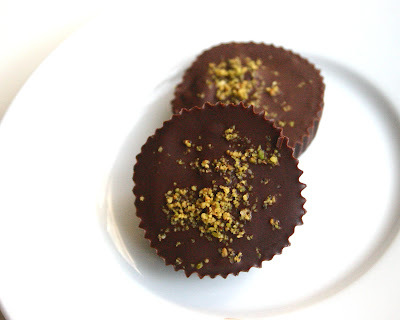 By adding sugar and butter you will get an even better pistachio paste to fill these cups. 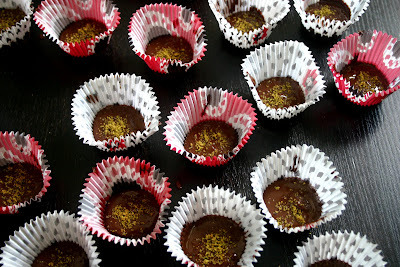 I have some of this left too and I intend to try making some other form of dessert with it. 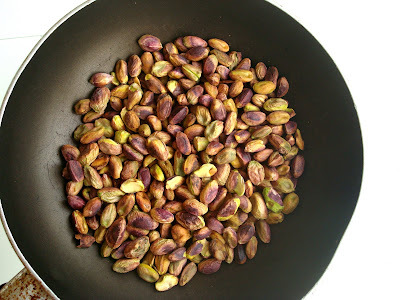 Toast pistachios until you start smelling them and then place them and salt into a food processor and process until the nuts turn into a smooth paste (if you want to decorate the cups with some ground pistachio, set some aside now). This will take a while, so don't give up. 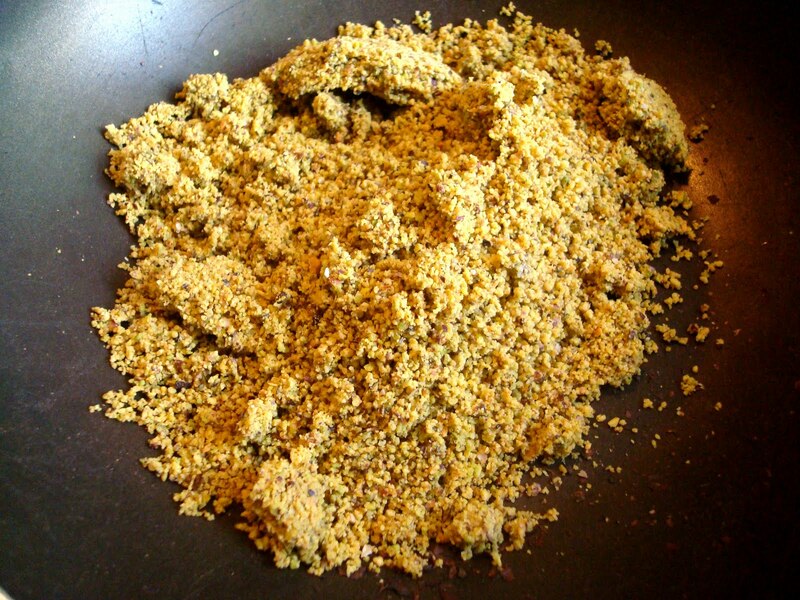 Drizzle in the oil while the nuts are being ground. Keep processing until smooth. That's it, you now have some delicious pistachio butter to use anyway you like. 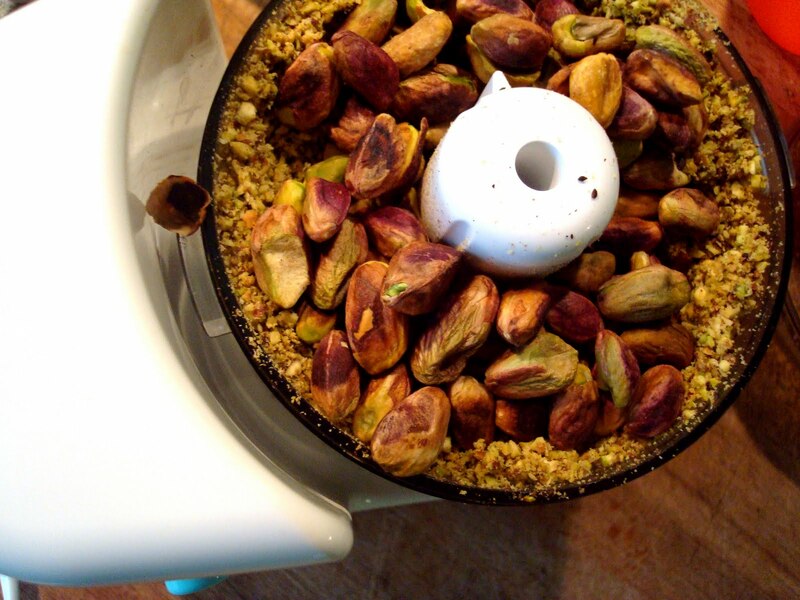 If you cannot resist the pistachio/chocolate combination, start making a sweetened pistachio paste by softening the pistachio butter, butter and salt in the microwave, trying not to melt it. Stir in the icing sugar. 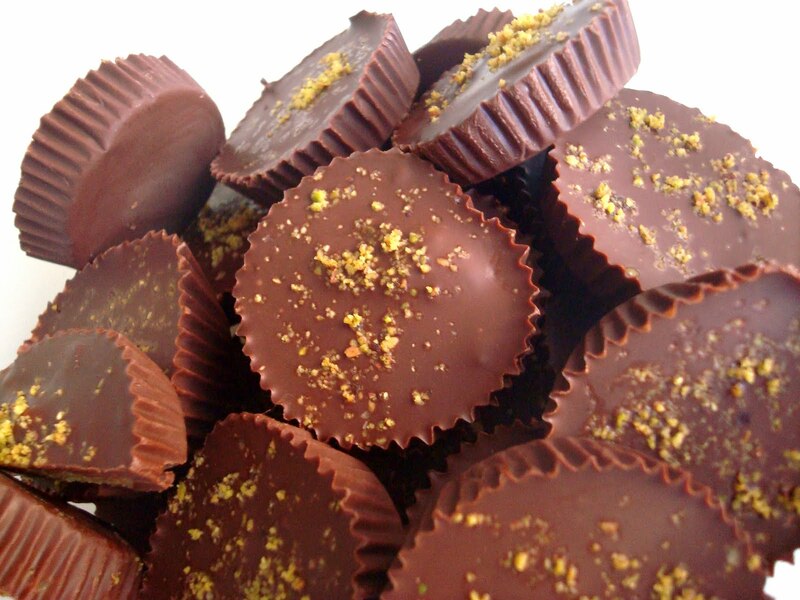 Melt chocolate and butter in a heatproof bowl over a pot of simmering water. Lay out about 30 small miniature paper cups for cupcakes on a tray. 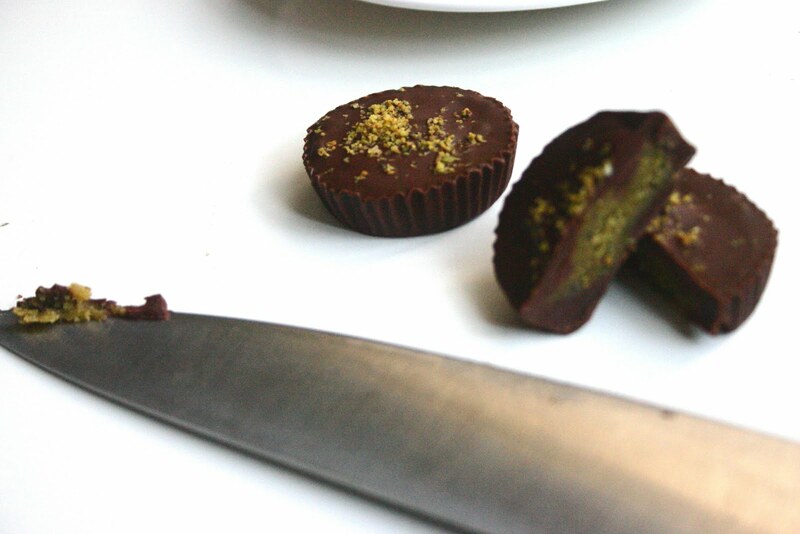 Drop in about a teaspoon of the melted chocolate, then a teaspoon of pistachio paste and top it off with another teaspoon of chocolate. If you like you can decorate them with a pistachio nut or some ground up pistachios. 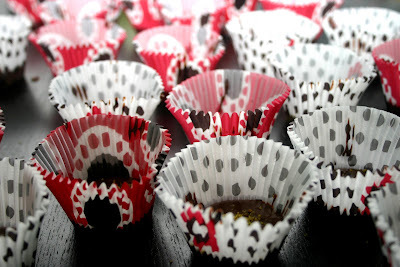 Refrigerate on a tray and when they are set store them in an airtight container in your fridge. Thank you to Manu from Manu's Menu for once again thinking of me for these awards. Since I recently awarded several of my favorite blogs with these, I decided to pass these on to some of my more recent favorite reads. La Caffettiera Rosa, Traveler's Lunchbox, Honestly Good Food, From the Bookshelf, Eat Tori, Scarletta Bakes, One Perfect Bite, and last in order of discovery but not least Global Table Adventure. Sounds like an excellent day! My husband also LOVES pistachios and Peanut butter cups - these are super adorable!!!! I like your warning too...it's why I don't bake much...I find it all hard to stay away from! Beautiful! HH - yours were ever so picture perfect...thanks for inspiring and teaching me. Manu - they really are great, try them. Off to pick up my awards. Thanks so much. DD&W - if we lived in the States, we would have to work hard to stay away from the Reeses'. I know what you mean about baked goods. Good thing I can bring some to the office (when the family lets me). These look wonderful; my kids love Reese's peanut butter cups too, so does my neighbor, and I have been meaning to use my pistachios to make some butter for a long while; so this is an excellent idea. Yours look pro. How nice to be able to ride bikes in a beautiful city like Milan. I may end up going to Tyrol with my daughter thanks to you! ToB - oh, how exciting that you are planning a trip there with your daughter. If you need any info let me know and I will send you my email. 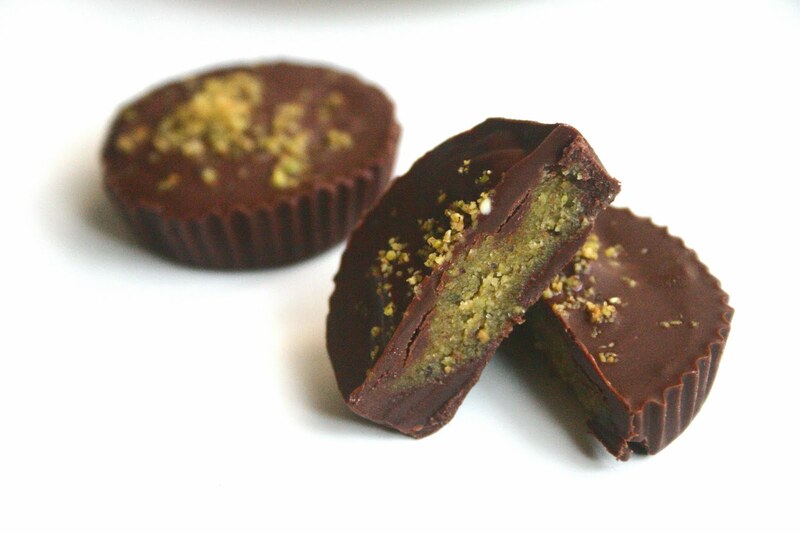 The pistachio takes these to a whole new level, although I am still a big fan of PB and chocolate. Lorraine - Thanks. 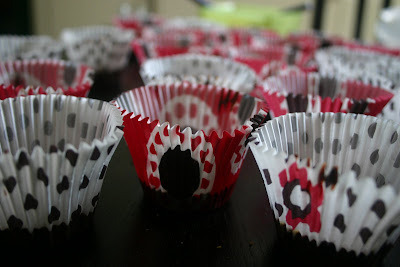 I loved HH's idea and her photos too. 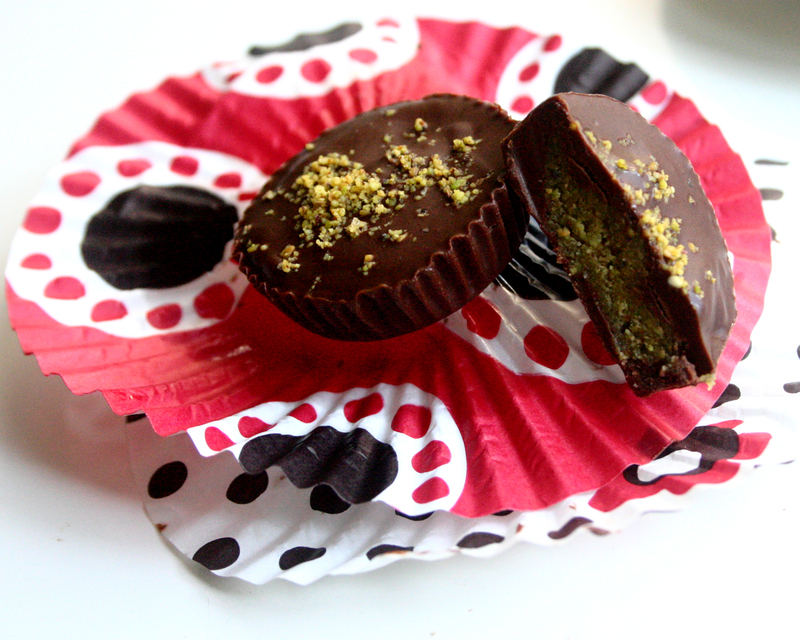 Those pistachio butter cups look HEAVENLY! Thank you so much for the award! It is the first one for me, and I am really, really flattered that you thought about my little blog, especially when seen the quality of the other blogs awarded. 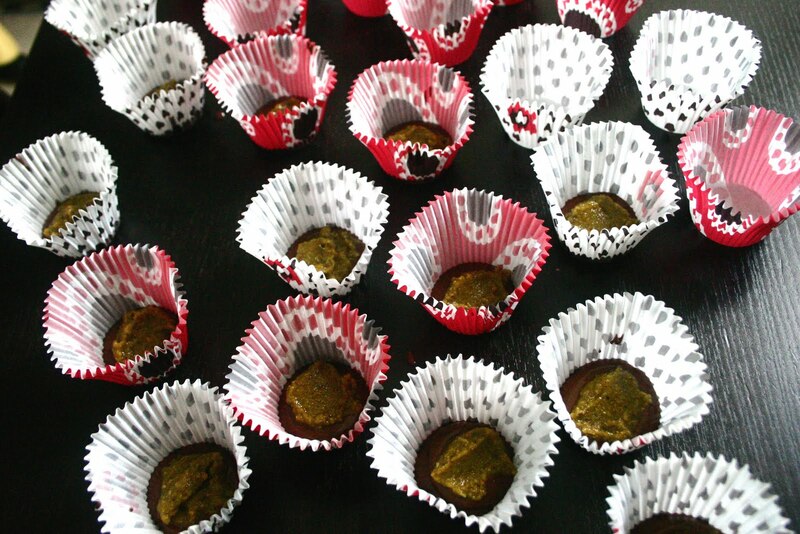 I think I may take your advice on these little treats and avoid trying them. I have added risk factors: I am the only chocolate eater around here, and I cannot be trusted near any nuts, in particular pistachio, in particular in form of pistachio butter. Oh my heavens, oh my heavens. i'm so glad you found my blog so that I could come back here and read this post! I absolutely adore pistachios (and chocolate, but that's a given), and I've been longing for pistachio paste ever since I saw some in Florence last year! Og, so much swooning going on in my head right now! Hannah- well, then this is for you. Thought your "pregnant in NYC" post was very funny. Welcome! So many wonderful things in one post! 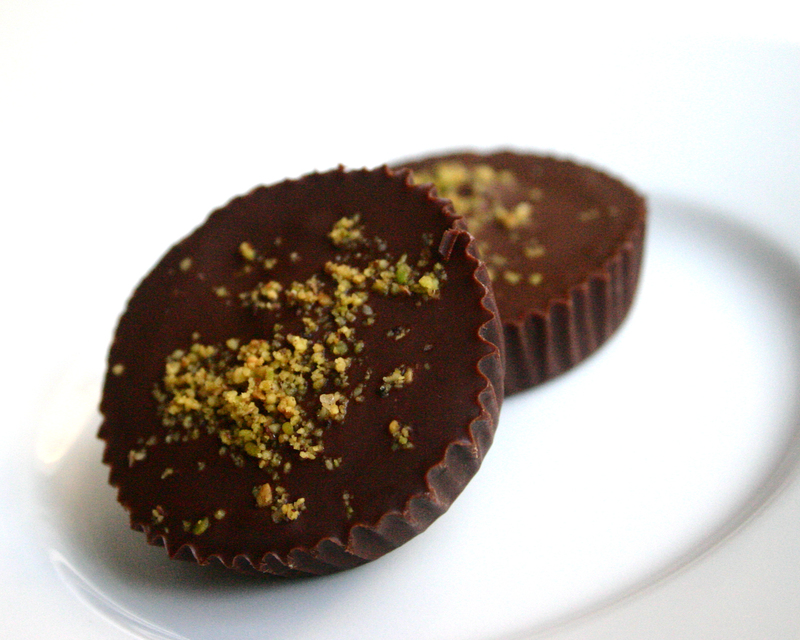 Absolutely love the idea of pistachio engulfed in dark chocolate. Be still my little heart! And a gigantic thank you for the awards! They are my first and I am very flattered! I would have answered sooner but I was in Italy for 2 weeks stuffing myself silly! Poached chicken "à la menthe"